Changing the oil of your car is one of the most common reasons to take your vehicle into service these days. 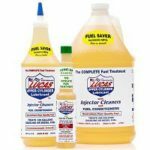 It also happens to be one of the few remaining things, other than using fuel injector cleaners, that car owners can safely and effectively do themselves in order to maintain their car. When it comes to oil, there are two major types – conventional and synthetic. The former is made from crude natural oil, while the latter is also fortified with numerous synthetic compounds and often refined further. 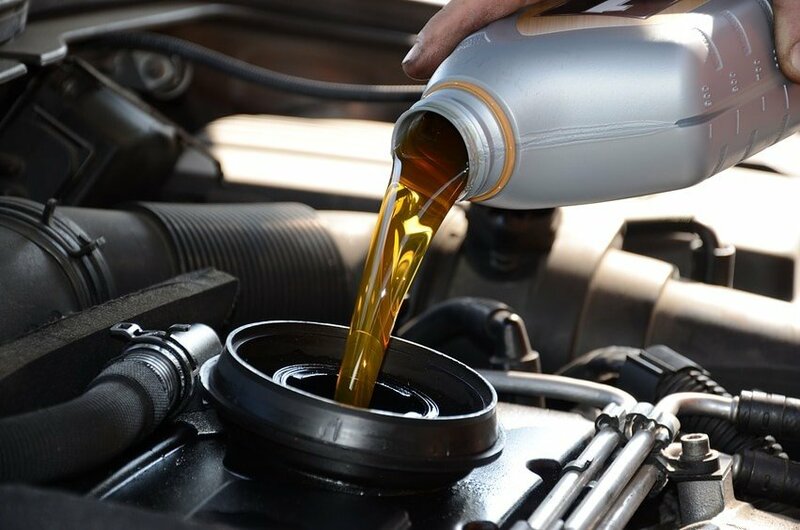 These days, synthetic oil is quickly becoming the norm, as it lasts longer and usually does the job significantly better, especially in extreme temperatures. What is the correct Synthetic oil change interval? How often do you REALLY need to change the oil? The common suggestion is to change the oil every 3000 miles. And numerous service stations and their mechanics gladly parrot this recommendation. After all, every time you come to change your oil, they will get paid. After every oil change, your windshield or the inside of your cars door is decorated with an oil change sticker, nicely telling you to come back in a few months or 3000 miles. Lovely. But is there actually any truth to this recommendation? Technology has come a long way, both in terms of vehicle engine complexity and effectiveness, as-well as synthetic oil properties. Are you being ripped off by service stations? Let’s look at some more facts. Mobil 1 Extended Performance synthetic oil is recommended for oil change intervals up to 15,000 miles or one year, whichever occurs first. That’s roughly FIVE TIMES longer than conventional oil change wisdom recommends. That’s massive. Imagine the savings from both the actual oil and the change procedure costs. You can run a conventional oil 5K miles but you should be able to run a synthetic oil 7500 to 10000 miles. Again, synthetic oil is likely to last far longer than what we’ve been led to believe. Royal Purple API-licensed synthetic engine oils allow motorists to travel as many as 12,000 miles as the recommended oil change interval. Even more amazing, Royal Purple HPS synthetic performance upgrade street oils allow up to 15,000 miles in between motor oil changes. Again, up to 15, 000 miles is possible. While it’s pretty clear why the car-servicing industry is so adamant about recommending the 3,000-mile oil change, most customers only follow this suggestion because they are largely uneducated about the advancements in automobile technology. When we’re talking about 2013 and later models, most automakers recommend oil changes every 7,500 or 10,000 miles when on a normal service schedule. That’s more than double the conventional 3,000-mile interval suggestion. The longest oil change interval is recommended for all Jaguar vehicles, which is at 15,000 miles. Shorter oil change intervals of 5,000 miles are needed for some Hyundai and Kia models with turbo engines, as-well as for some Toyota vehicles that require non-synthetic oils. But with that said, Toyota is also shifting their entire fleet towards synthetic oil use and 10,000 mile oil change interval minimums. It becomes pretty clear, pretty fast, that casual vehicle owners are being tricked into thinking they need to change oil far more often than they really do. Clearly, service stations are looking to squeeze out every last penny from the consumer’s wallets. But what’s strange, is that many people even when told that their cars can keep going far longer, will still opt to change oil very frequently. Now, many people also make the argument, that it’s better to be safe than sorry, right? But that’s a nonsensical argument when the leading experts are all saying such frequent oil changes are simply not needed. There is no danger of being sorry. Your engine will be fine. But there is one real danger. The danger of pollution. Product education specialist for Toyota, Chris Risdon, agreed. Advances in oil technology means that you can change oils much less frequently and protect the environment at the same time. Waste oil is a serious problem that’s exacerbated by too-frequent oil changes. California Integrated Waste Management Board has campaigned against the 3,000-mile dictate for a while. The agency has reported that 153.5 million gallons of used oil is being generated in California every year, but only 59 percent of it is ever recycled. That’s a considerable amount of potential pollution dumped into the environment. I don’t know about you guys, but it seems very clear to me that when it comes to synthetic oil change interval, less frequent oil changes is the way to go. Not only are you going to save time and money by spending less of both at service stations; you are also contributing to the preservation of the environment. Think about it! I only drive Maybe 8,000 a year, Maybe. So I’m concerned with time vs mileage. could I go a full year before changing synthetic oil? (I go to ‘Brakes Plus’ who don’t use Mobil 1, but say it’s it meets the specifications of synthetic oil). I think going a full year is fine. There’s a lot of debate about whether or not time is a factor at all. Personally I think it matters a bit, but 1 year is probably not much to worry about. Maybe if you live in the part of the world with very hot summers, cold winters and rainy springs and autumns. The massive temperature and moisture intervals may put additional strain on the car, but aside from that, I don’t think 1 year is anything to worry about at your mileage. I run the oil (Mobil 1) upto 15k miles in my Volvo and Mercedes. Our Aurora 3.5l also gets Mobil 1 but I skip oil changes and change the filter only because the engine uses oil. From one Oldsmobile owner to another, Stop That!! Change the oil at least every six months. My 4.0 also uses oil but you still need to drain out the solids on the bottom of the pan. Also since the engine doesn’t burn all the oil off, that means a lot of it never gets changed. Use your Auroras oil life monitor and change it when it says so. I had the same concern. Thank you for sharing your opinion. So long as your engine is in good condition, not leaking or burning much (if any) oil and producing good power, 1 year is fine with a good synthetic oil. My personal experience: both my vehicles are on a 7500 mile/1 year oil change interval, whichever comes first — have been doing this for many years and they both run perfectly smooth, never had any issues. The insides of the valve covers are very clean. Many people use the “extended service” synthetic formulations and are comfortable going 10000 miles between changes. I’m not quite there yet. Regardless, be sure to use a filter that is capable of going the distance… standard filters may become saturated before the extended drain interval arrives. And as always, your mileage may vary, proceed with some discretion. Try having an oil analysis done at around 6000 miles and see what comes back. How to change oil amijet? The oil , no matter what you decide to use , gets dirty and so does your filter. You need to change your filter as recommended by the manufacturer. Also you still need to check your oil level and at that time look at how dirty/ discolored compared to new oil. Then you make the decision of whether to change or not. 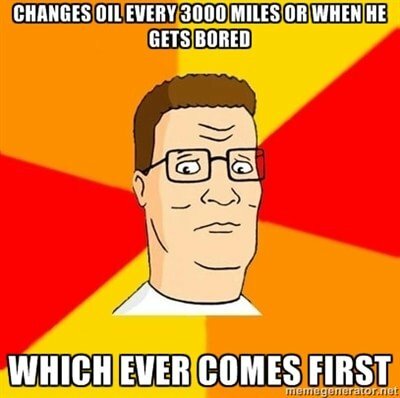 Personally I would never go pass 8000 miles without changing my oil. I have rebuilt several engines and know what build up of dirt caused by not changing oil soon enough. No matter what oil you choose to use all oil gets dirty and filters get clogged. I am just wondering if Mobil 1 has been tested for over a million miles on an engine when changing just the filter regularly, why we need do anything but top of Mobil 1 as needed and regularly change our filters. No it’s been tested for 500,000 miles though on a Camry ( video). But attention to detail shows that they changed the oil and filters every 10,000 miles. hi …I’ve Suzuki Mehran 2003; when I can change my engine oil. I only drive 5000 to 6000 a year. The vehicle is a 2000 Ford ranger 2.5l auto. I change my own oil using Mobil 1 extended performance 5w30 (15ooo mile protection) once a year. WIX oil filter. I have had the vehicle for 6 years now with no issues. Previous owner used conventional oil. I live in the Great Lakes region. The truck only has 65000 miles on it. I used to change my oil/filter on my own for years with no problem. Due to back problems, I now have it done by oil change franchises. I have been to a number of oil change places and have found that the majority do not fill to capacity. Specifically, I have found shortages mostly by one half quart. Two other places under filled by one quart. On each occasion, I went back to the location and they topped it to capacity. Now I am wondering if this “tactic” is used to get more money out of each consumer as being short a half or one quart may not even be noticeable to the average consumer, while making literally thousands of dollars to the franchises. I assume it’s OK to not change the oil filter for a year as well? Depends on the oil filter. Some filters like the orange gram filter are only good for 5000m or 8000km. So you will have to change that filter. You can buy better filters like Mobil 1 filters that last at least double that mileage. Just read the filter. Mileage is only one indicator that should dictate oil change frequency. Type of driving should be another. Short trips where the engine does not reach operating temperature reduces oil life. So does very damp weather. That said, we (the US consumer) change our oil way too often. I use synthetic oil and change the filter ONLY every 3500-4000 miles. I change the oil every 4th filter change cycle. A little quicker if my driving is a lot of short-trip (see the comment above). I’ve been doing it myself for about 15 years but before that I used to have Jiffy Lube change the filter (not the oil) and we agreed on a $10 charge. One other thing. I now use the original equipment filter and the sole reason is that I believe that the settings for the oil pressure relief valve (the valve inside the filter that opens when the oil pressure exceeds a certain value) are specific to the engine. My last vehicle lasted 277K miles and I had no engine issues. Trying to determine the correct interval between oil changes for full synthetic in a new engine, by appealing to the “experts” is impossible since my research has found opinions ranging from 5000 mi. to once yearly and everything in between. So, I think I’ll go with the common sense approach which is – in my non professional opinion 10,000 but change the filter at 5,000, and if the oil looks, smells, or feels, (when compared to new oil) bad change it also. I have proven repeatedly that by over maintaining an engine meaning clean oil, air filter, and fresh spark plugs occasionally can easily double it’s life. All this oil change stuff is keeping your engine block from wearing out but I’ve found that everything else on a car is going to start falling apart long before that happens. Transmissions, drive axles, struts, steering, HEAD GASKETS! spark plugs, fuel pumps, air conditioners, etc. etc. All kinds of things that are very expensive to repair and eventually use just figure it’s better to get something else than to keep pouring money in the old thing. The motor is still in great shape though, you’ve been keeping the oil changed. You’re partially right. A lot of other things will go bad before your engine itself–for instance, on my car the engine is perfect but I’ve had to replace the starter and the suspension. The difference is the cost of repairing different things. If your fuel pump goes bad, it’s a $30 part and less than an hour of labor to do it yourself. If you don’t change your oil at the right intervals and wear out the insides of the cylinder walls there’s nothing you can do other than buy a new engine. You’re talking $3,000-$6,000 for basic cars, not to mention bigger engines on luxury cars. It’s something that got on my nerves with one of my first cars (an 1986 Honda Accord) that everything on the car was broken except the engine and transmission. One door didn’t open, the windshield wipers were out, Windows didn’t roll down, etc. But the thing still ran, because the owners had taken care of it. I bought my 87 ford van with 30K miles and used mobile 1 and a filter every 25 K miles. it wouldn’t be reused: one of the few things on it still quite usable. I drive 3000 miles a year in NYC can I change my synthetic oil every 2 years? the infamous “aunt millie test”, probably the most destructive oil test ever invented, don’t try this at home kids, we are trained professionals…. 2. The driving test consists of two short cycles, a 3 mile and 1.5 mile test. 4. The bulk oil temp ranged from 90 C in the summer to 30 C in the winter. 5. Fuel dilution was as high as 11%. 6. Cleanliness was excellent, the deck sludge rating was 9.7 out of 10. The oil was a 5W30 running in a 3.1 L V6 with no oil drains. The oil volume sampled was 5.5L and make-up was 4.4L. TBN retention was 33. Test duration was for 60 months. The real issue is acidity building in the oil which degrades hoses, gaskets, linings, etc. Contaminants input material that causes oil pH to drop and possibly become corrosive. HDEO’s (heavy duty engine oils) which have a more robust additive package tend to be well suited to extended drain intervals. The byproducts of combustion create acids which the oil must neutralize to protect the engine. HDEO’s which are approved for diesel use have more acid neutralizers so they have more reserve. Synthetic oils tend to oxidize less at high temperatures, and have a more uniform molecule length which helps it maintain its viscosity after many miles. Conventional oil is a mix of long and short molecules. They blend them to get the desired “average” viscosity (thickness). You can think of short molecules as gasoline, and long molecules as tar. synthetic engine oil is a far better oil than conventional. reason is the synthetic oil does not absorb water/moisture. the synthetic does not then turn to acid and then effect the metal and seals .. the synthetic is stable at the high temps. also less stress on the engine on extreme hot /cold starts. on yearly low mileage vehicles changing the oil once a year is proper. 7500 miles on synthetic is going to be no problem at all . 10-15K miles is what many do ,that would be the high end. conventional oil requires changing @3-4K miles. this is because it depends on the oils condition the engines condition. conventional oil has issues with moisture and extreme heat /cold so that is why it requires this low mile changing. the oil does create sludge . the new engines have very small oil passageways this conventional with sludge causes blockage restrictions . using synthetic oil you can reduce the oil change costs and save vehicle down time . you can easily get twice as much use with synthetic and not have the damage that conventional can create if sludge forms. i have a 2014 Lexus IS 250 that sits in a garage and gets about 1000 miles a year.When should i change the synthetic oil? Oh, that’s an easy one. READ YOUR MANUAL. Change it every 5 years or 10k miles whichever comes first. My Tacoma has 13K miles and 14 months since last full synthetic oil change. I check the motor oil regularly I look for moisture, changes in color of oil and viscosity. I never burn rubber accelerate or brake with extreme prejudice. She loves to play in the mud in the winter though. That’s about it, should I be more cautious or change the oil more frequently? Hi, Im from Europe, I drive a Peugeot 206, its 15years old and I have changed oil only 2 times in it, I only use full synthetic 0W-30 motor oils, first it was an Esso Ultron now its a Castrol High Performance oil, the engine runs perfectly smooth, no issues whatsoever, the engine doesnt use any oil at all, no need to refill it ever, I check it on a regular basis, the oil is still golden like when it was filled in the first time, performance is the same like when it was new, so I guess that answers your question, if you buy ful synth high performance motor oil you dont need to change that often, also all that said I dont drive the car every day, but according to factory sheet I only have to change oil every 30.000km, so I only care about that, not about time, because high tech oils simply wont age. Changing the engine oil every 3 YEARS is stretching it a bit too far in my experience. 2yrs would be the max time I would run any quality “full synthetic” and have successfully done this regimine in my “summer use” 2015 Lincoln MKZ sedan that sees about 2,500mis per yr.
@D-Man Really? You have successfully done this over a 5,000 mile one cycle period? At that rate come back it 15 years and tell us if we can go longer. Hi ,I m from Canada ,I drive a Chrysler sebring 2007 it,s 9 years old change oil only times in it ,I use full synthetic 5W-20 motor oils Mobil 1 and I,m so happy for driving and I only have to change oil every 8000 km . I have a 97 Toyota Corolla and 91 Volvo 240…. I’m reading all comments… Truly folks – are u saying using synthetic oils I can go as much as 7000 miles? Or is that just for newer vehicles… Also if you are not changing the oil, are you adding oil when needed? I just got an oil change in my Scion tC. I asked for full synthetic. The new sticker on the windshield says I should change it in 5,000 miles, even though the technician said 7,000 would be fine. 7,000 it is from now on. My wife drives a 2010 Toyota Camry about 4000 miles per year. We have the oil changed at the dealership. The car runs great. How often should I change the oil? Bob if you use 5W-30 your Toyota warranty say 5000 miles. I change my 2004 Toyota Corolla out twice a year. I use what ever Synthetic is on sale at the time. Last time it was NAPA its the same thing as Valvoline Full Synthetic! That and a good filter that oil change is going to cost me $21 and a few cents using a Purolator One 10K filter. I’m personally for saving a little less money and knowing my engine is getting the treatment it deserves. I can afford $42 dollars a year for quality Synthetic Oil changes. The car has 110700 miles on it now and barely uses a 1/4 pint between changes. I used full synthetic oil on the M-B M350 SUV, but weird things have already happened twice. I changed the oil about 6 months ago, and the oil change notice on the screen had been renewed to change oil when fulfill 10,000 miles as M-B manual required. Yet the mileage was just over 980 miles, the screen warning showing that after 21 days the oil has to be changed. This weird things has already happened twice. I really don’t know if M-B has programmed some tricks to fool us to change oil as many times as they want us to do, since M-B dealers charging $189.00 plus tax and labor for synthetic oil change. Do I just disregard it until the mileage reaching 10,000 miles? Thank you. I have a 2006 Ford Taurus and it calls for 5W-20 full synthetic. I go through about a quart every 1500 miles. So with me adding a quart every 1500 miles would I be ok just changing the oil filter and doing a full oil change around every 10,000 miles? If I were you I would just change the filter every 10k miles and never change the oil The amount you add refreshes the oil mixture plenty. I agree with you. I change my synthetic oil once every 20000 miles and change the filter around 7000. Be sure to top off with the same oil and weight. That’s a lot of oil consumption. On my 2005 Taurus I go a year and about 8000 miles without adding oil. I have a 2012 honda accord. I drive relatively short distances, 2.5 mi one way, to work 5 days a week plus errands. I just bought the car in july and it had the oil changed prior to purchase. My oil life indicator was down to 15% 4 months later and less than 3000 mi. Is there something wrong with the indicator? This is a wonderful site! I have a 2004 Honda CRV in very good condition and have used full synthetic oil for a long time. I bought the car new, so the odometer is accurate at 51,000 (I’m retired). I had my oil changed last May at the dealer. Can I wait until next May for my next oil change? Thank you. My Vauxhall 2011 Astra 2.0 cdti sri ecoflex does c 1500 miles pa. my main dealer agents say I should change oil and filter after one year. So They Are At It! Common Practice in the U.K.- Rip-off Britain. They Should be Prosecuted. Come On! Changing engine oil should be based on driving conditions:get two cars with same km and change oil for both and drive one for 5000 km long distances and the other for 5000 km short trips and check the oil for the long distance one will be clean and the other one will be dirty. However synthetic oil remains clean longer than conventional and mineral and good for extreme weather conditions. Always check owners manual if it says to change oil under normal conditions every 5,000 km or 6 month which ever comes first follow the same even if the oil still clean. while the synthetic oil may last .. you may still want to change your oil filter every 6000…. for a car just converting to synthetic you may want to change your filter every 3000 for a while..
clogged filters will damge your engine.. In my 50 years in the Motor Trade I have never seen Oils as good as the ones we have today. I tell my customers to change there oil every 10000 and always change the Filter as well the other thing is go for an oil that has an API of SN or better. A 5w-30 Synthetic of a reputable brand and you are good to go If you are changing from a Mineral Oil to a Synthetic I recommend a Flush Product such as Wynns Flush which can be added to the old Oil. And the old saying “If in doubt read the instructions. My 2004 Jeep Grand Cherokee 4.7L has 120,000m – it “humms”. Jeeps are awesome and last forever when maintained well. Use “full synthetic oils” only and quality long distance oil filters and go 1-2 yrs or 12k mis easily. Mobil 1 EP or Pennzoil Ultra Platinum or Royal Purple are my choices! Drive on! You know I get my Synthetic oil online with Walmart under $23 for five quarts. My filters I get from Fred Meyer or Amazon for under $8. My oil is Mobil 1, Castrol EDGE full synthetic or Valvoline full synthetic which ever is on sale. So combine that with the 99 plus percent filter that is on sale any you have a $30 oil change. I don’t drive that many miles since retiring. So I just change twice a year rather than being cheap. My Toyota Corolla has 108442 miles on it currently. I fully expect to be driving this car when it turns 300,000 miles. Because I can afford the extra cost of $60 a year vs. $30. Thank you so much for your “frugal” approach. Recently brought our Lexus 400h in for an oil change because the maintenance required light came on the dash at 5000 million. We do synthetic. The bay attendant said we are only required to change at 10,000mi. But then changed her stance saying because of the mileage, 136000+, we should be having it changed at 5000. I now will go longer between changes. Will have to Google how to reset the maintenance reminder. I have switched conventional engine oil (Petronas Mach5 SL,20W50) to synthetic engine oil (XTeer GASOLINE 20W50,SN). Some really wonderful info , Sword lily I found this. “The distance between insanity and genius is measured only by success.” by James Bond Tomorrow Never Dies. I can feel when the car needs an oil change; not quite as zippy at about 4K using 89 grade gas. Now here`s the kicker; add a load of premium gas and it just purrs down the freeway unrestricted at 80 mph. Change oil every 5K. Next oil change at 85K is the big switch to Synthetic; any suggestions on which oil change drive through outfit uses Mobil 1 or Royal Purple? Not sure which drive through uses what. They tend to buy in bulk barrels to save money. You can go to Walmart and a hand them the Mobil 1 like I did with my wife’s car. My big switch to synthetic was with a 2000 Ford ranger 2.5l engine. This was 6 years ago. The previous owners used conventional oil. The oil level went down half a quart in approximately 3000 miles of driving. At the time I worried that it would continue to do this with synthetic oil. But I “guessed” that the synthetic oil was working all the sludge and deposits loose, and the engine was using some oil because it was dirty. I changed the filter out. After I changed the oil the next time it stopped using oil. I only drive 5 to 6000 miles a year and change the oil once a year. I do my own oil changes. My husband always took car of cars and he recently passed. He always put mobile synthetic oil in them but I don’t know how often! Any suggestions. The First in Synthetics, AMSOIL SYNTHETIC OIL. My MB C250 4-cylinder turbo coupe annual miles drive is under 4 grand. I don’t make short trips. The weather on our southern west coast is mild. I’d like to use a two years OCI. I have a 2011 Chevrolet Equinox with a 2.4 L engine at 98,000 it required an overhaul due to high oil consumption 1 quart in in 1,500 miles, oil changes were reported to have been at 8,000 miles intervals using a full synthetic. Timing chain was shot, rings gummed up stuck, gas mileage 6 MPG lower than after cleaning and repairs, and VVT was sticking and causing check engine light to come on. I have done 6 engine flushes and the last flush released enough sludge to nearly plug the oil filter. I have a 2009 Pontiac Torrent oil changes every 3,ooo to 3,500 miles the vehicle has 250,000 miles, no major repairs. I do agree the synthetic oil has a long life expectancy from break down, but break down is not the problem the real issue is the contamination from combustion. I have worked in the Ammonia Refrigeration industry since 1985 the change from conventional refrigeration oil to synthetic made a major difference. we formerly had 700 hp compressors requiring thrust bearing replacements every year & requiring oil changes every 2,000 hours. We switched to full synthetic oil and started using USPI side stream micro filtration this has allowed us to run in excess of 12 years with only doing oil analysis and changing depth filters when particulates rise. We also tried using the same technology on air compressors, extending oil life but not nearly to the extent of a sealed system a refrigeration system provides. I will have to disagree with you on your comment about frequent oil changes. There is oil coating the parts of the engine and it doesn’t all drain away so your engine is “dry”. I live in the Great lakes region and according to vehicle manuals our driving behaviors equate to severe driving conditions. Short trips, stop and go during hot weather, cold winters, etc. Possibly the majority of drivers meet this status of severe conditions. That means to follow the owners manual. When the oil change is done it usually is warmed up well lubed and you are on your way in 30 mins or so. Probably less wear is done then letting it sit over night. Or for days like my elderly parents. My last truck was 18 years old and never lost its mpg from brand new. I changed it my self every 3000 miles. My parents vehicles lasted 17 and 18 years under these conditions and frequent oil changes. It wasn’t the engines that gave out. it was everything else that basically was failing on vehicles that we decided to buy New. I have a co worker with 300,000 on his Neon. He has had a few oil changes using conventional oil. Without giving away my age I have been dealing with the care and feeding of cars since the early 1960’s. I remember when I used straight weight oil in my Corvette and changed it seasonally. Talk about pollution! Anyway, after reading the many, many comments posted here over the past three years I felt obliged to offer up my own opinion. Motor oil has come a long way in the past 75 years. As a matter of fact, it was World War II that arguably had the greatest impact on the oils that we use today. Without getting into detail, it has even been said that research done with motor oil during the desert war in Africa saved American tanks and allowed for the concurrent victory in that campaign. I have always viewed changing oil as one of the cheapest insurance policies you can buy. And, while I don’t fall for the 3000 mile sales pitch of car dealerships, I do believe that time, miles and the way you drive are the three greatest factors in determining when an oil change is needed. Little old ladies who drive to church once a week should probably change their oil more often than than the person commuting several miles a day on the highway. I’m now retired and do not drive nearly the way I once did. My daily driver has 220,000 miles on it. I run Mobil 1 in this car and was changing oil and filter (Wix XP) at 5,000 miles. Since I no longer drive those miles I have changed my schedule to a six month program instead. I am also no longer a boy racer looking for the next stop-light challenge. But, for those of you that push your car more than the average, good lubrication is the best way to maintain your engine. I have also owned a number of turbo-charged cars over the years. The requirements of these high revving components certainly call for the best of motor oils. I suppose if I was paying $500 for an oil change I would probably be trying the get as many miles as possible out of it. But, the truth of the matter is oil changes are relatively inexpensive and cheap insurance against costly repairs. Good comment! I drive 5 t0 6 thousand miles a year, Switched over to Mobile 1 Extended Performance (15,000 mile protection) 6 years ago when I bought the 2000 ford ranger. The previous owners used conventional oil. It runs fine, better startups in winter. It uses no oil. I change it myself once a year. It has 44000km I was over my scheduled oil change by 3000km. the car stalled and when I checked the oil it was dry. I had to put 3 litres in. Is this normal? If the synthetic oils theoretically can be run until 15000 miles then that same oil in a car that registers in kilometres should be good for some where around 20,000 kilometres be fore it needs an oil change when the miles to kilometre conversion is done . Am I correct ? i heard that using synthetic oil will cause your bearings to spin sometimes. Man there are a lot of dumb people in the comments here. If you begin a question with, “I drive a [insert model year and make]. How many miles should I…?” then you seriously need to learn to open up your car’s manual and learn to read. Such basic things like that should be known before you even step foot in a car. Every responsible driver should know what kind of oil their car takes and what the interval should be. When i lived in Italy the dealership itself recommended to change oil every 30,000 km or 3 years with synthetic! It was for a brand new 2004 vehicle. I always try to keep the intervals for my oil change the same as best I can. Going over by a little bit doesn’t hurt, but a lot of mileage can do some damage. It is interesting to see and does make sense that a synthetic oil would last longer than conventional. Perhaps I might make the switch and extend my service intervals. I drive a 2006 4 super duty 6.0 And I’m told of change my oil every 5000 miles and I run pure synthetic What is up with that? It is my understanding that the terms “Full Synthetic” and “100% Synthetic” are NOT interchangeable. Full Synthetic is partially consisting of Dead Dinosaurs while 100% does not. And NO, I’m not talking about Synthetic Blend (whatever the hell that is). It seems that the oil industry browbeat the FTC into allowing a change in the definition of Full Synthetic to be something less than completely synthetic. Opinions? The quick-lube chains usually acclaim it be done every 3 months or up to 3,000 miles, but many mechanics would tell you that such regular changes are overkill. , most car owner’s manuals recommend altering out the oil less frequently, usually after 6,000 or 7,500 miles. I drive an 05 Is300 and I’m lucky if I hit 3000 miles in 6 months. I get full synthetic valvoline oil put in my car. I don’t drive much obviously and living in Southern California the weather can be dry, and hot most of the time. Should I go a year before changing the oil or is every 6 months OK? My grandpa used to tell me it’s never good to let oil just sit in the car if you really don’t drive it 🙂. All mainstream manufacturers oils make the grade when it comes to achieving their stated efficiency. Lets face it, we are not driving in the Le Mans 24 hour race or Formula One. Engine manufacturing techniques and materials have also improved considerably and the oil no longer has to suffer metal particles and sludge as it did when I was a youngster. Short runs cause the build up of moisture in oils so mileage alone is not way to judge oil changes. Fully Synthetic is a must for turbocharged engines so as to stop carbonating the the turbo bearings by heat. Non Turbo Engine should have their oil and filter changed in accordance with the manufacturers recommendations, or when it starts to look dark and dirty. This is usually at set mileage or interval whatever comes first. As for every 3000 miles, it would need to be Death Valley or the Sarah type conditions to justify that. Still, if it keeps you happy and feeling good about things! Someone commented about how oil and filters get dirty on their own. I’m not a mechanic, but think about this. Dusty air is pulled (or blown) into the cylinders where gasoline is ignited and burned. Some of that burned dust winds up on the cylinder walls that are coated with a fine coating of motor oil, and with each revolution of the camshaft, that burned dust gets washed down into the oil sump. Eventually it’s going to get dirty. It might actually be more important to change your air filters every 3000 miles, rather than your oil. Especially if you drive in environments with lots of stuff in the air. Dust, pollen, etc. Any thoughts? My car has had the “OIL CHANGE REQUIRED dash message come on every month. At the time of the message my mileage has increased only 1,200 miles. The OIl LIFE percentage indicator is no longer in my digital display like it used to be. 1. Based on your article are you saying that I can wait? It currently has about 70,000 on it. 2. Will the CHECK ENGINE LIGHT come on at any point between oil changed? Thank you for your time – your response will help me decide.